Kevin Bacon's "Do Good Challenge" for UMd. 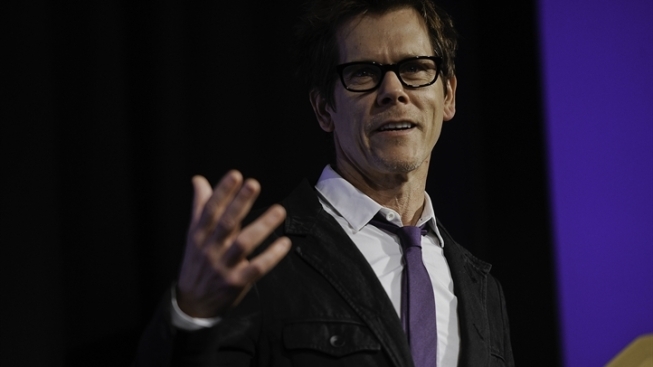 Kevin Bacon's Do Good Challenge at UMd. Weeks of intense dedication to philanthropy paid off for six teams of University of Maryland students last week. The University’s School of Public Policy Center for Philanthropy and Nonprofit Leadership hosted the "Do Good Challenge" Finals in front of a packed house of 650 people and a panel of celebrity judges. Actor Kevin Bacon, Today Show correspondent Joy Bauer and former University of Maryland men's basketball coach Gary Williams reviewed presentations by each of the finalists in the style of American Idol. More than 130 submissions were narrowed down to six finalists: Zeta Tau Alpha sorority, the Food Recovery Network, Distance for MD, Nepal, Leave One Take One, Men’s Hockey/VetDogs and UMD Students Helping Honduras (UMD SHH). The Food Recovery Network, a network of student groups that recovers surplus food from around campus and donates it to local shelters, took first place in the competition. The students won $5,000 and other prizes for their cause. “It was a very good opportunity for us to get our word out there as a food recovery network,” he said. The Food Recovery Network “does good” in the D.C. area as well. “We deliver all of our meals from the University of Maryland directly down to one of our three partner shelters in D.C.,” said Food Recovery Network co-President Ben Simon. “We’ve already donated about 32,000 meals since we started up a few semesters ago, but now…we’re in the process of expanding nationally and hopefully before long, it will be at every single college and university in America," he said. The UMD SHH team entered the challenge hoping to use the prize money to complete an elementary school in Honduras, a project that 23 students started in January. Each team had six minutes to present their pitch to the judges. The judges then had four minutes to make their comments and ask questions before the top three contestants were selected through audience participation. Attendees voted for their favorite group by text message before the judges determined first, second, and third prize. According to Dr. Robert Grimm Jr., Director of the Philanthropy and Nonprofit Management program at Maryland, the teams were judged based on three categories: impact, creativity and how they incorporated social media. Bacon’s own philanthropic organization, SixDegrees.org, served as one of the sponsors of the event. As it turns out, Bacon is only a two-degree connection away from University of Maryland alum Karen Levenson and her husband Bruce. “My nephew works for an organization called the Network for Good, the Network for Good partners with Kevin,” said Bruce Levenson while explaining how Bacon's organization became involved with the University of Maryland. Bacon said the partnership benefits both his organization and the students who participated. Now that the competition is over, it seems the only question left is if there will be more challenges with Kevin Bacon in the future.